Looks easy, huh? But outback driving can have hidden dangers. The sheer, wide-open space, the epic views and abundance of wildlife make an outback roadtrip one heck of an experience, but before you set off, you should be aware that this journey is unlike any other drive you have experienced. The distances between destinations are long, you drive for hours without seeing another person or petrol station (and sometimes even corners in the road). And animals may look cute, but they can be a dangerous, sometimes deadly, obstacle on the road. 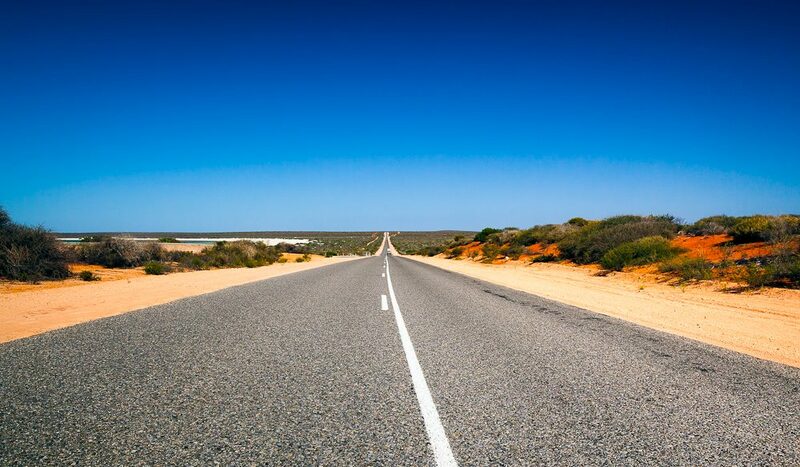 So here are five tips for outback road safety. Even if your car or campervan is a rental, you should make sure you perform some simple vehicle maintenance checks before and during the journey. • Check your tyres and inflate them to the required level if needed. • Locate the dipstick and check the oil level. • Make sure you have a spare tyre with you. • Check if there is a toolkit. • Make sure you have a campervan or car user-manual. Don’t try to walk to get help, as you will probably be walking for a very long time in the heat which is dangerous. You might have to wait for a few hours, or even a day for someone to pass by, but it’s the safest thing to do. It’s a good idea to carry a white bed sheet, or anything that can be used to attract attention should you need it. Plan ahead and stock up on food before you head off. There are remote service stations in the outback where you will be able to buy some provisions, but remember that they may have restricted opening hours and limited ATM facilities. There will also be country motel restaurants and roadhouses if you are in need of a cold drink or hot meal, but be aware that they will cost more than what you would pay in the city. You should bring enough water – 4 to 5 litres per person, per day. And ensure you carry sufficient food supplies should you break down. Consider stocking up on cereal bars, nut and seeds (avoid salty foods that could accelerate dehydration). When to fill up? Never underestimate how far away the next petrol station might be – if you are running low, then take a stop and fill up. 4. What road conditions can you expect? Road conditions in the outback can change suddenly and you may find yourself suddenly driving on an unsealed road (gravel track or field). If you have hired a campervan or car from a main city, such as Sydney, Melbourne or Brisbane, then you may find that driving on unsealed roads voids your insurance – leaving you liable for the total cost of any damage. If you are travelling around Western Australia, you should be aware of the heavy rains and flash flooding that can occur. If you do find yourself at a flooded crossing, do not attempt to drive through if the water if it is too deep or fast flowing – and don’t wade into a fast-flowing river to find out. It’s not uncommon to come across wildlife in the outback; kangaroos, cows and other animals on the roads, particularly at dawn, dusk and at night. Avoid driving at night, and ask your passenger to stay alert, scan the road ahead and tell you to slow down if they see anything. Kangaroos have a habit of changing direction suddenly, so if you can’t stop in time, it is sometimes safer to hit the animal than to swerve into oncoming traffic or risk losing control of your vehicle. If you see a road train or other large vehicle coming towards you (from front or rear) it’s a good idea to slow down and get as far left as you can with safety to let them go past you. Hitting their slipstream at speed can be quite a jolt, plus you might be left in a cloud of dust with little or no visibility. Thanks Lorraine – a great tip.